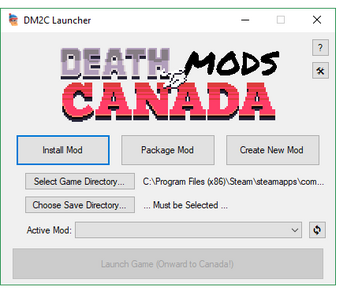 Death Mods to Canada, the Death Road Mod Manager, is a tool for creating, packaging, installing, and playing mods for RocketCat and Madgarden's Death Road to Canada. Keeps mod files separate, so you don't need to worry about overwriting the base game files. Stores save files individually for each mod, avoiding game breaking bugs! Modders can package their mods as .dnk files, allowing easy distribution and installation. Modders can test unpackaged mods to improve workflow. This tool is in active development, so it's full of bugs and will be getting new features over time. If you've encountered a bug or have a feature request, I want to know about it! The latest update (5.3a) contains many new features and is much easier to use. I've done a lot of testing to reduce the amount of errors you may encounter, but there's probably some I've missed. If the program crashes, something doesn't work the way you thought it would, or something doesn't work the way you think it should, let me know in the community discussion on this page or email me at support[at]cmcgdd[dot]com. If you've got a Death Road mod, let me know. I'd love to feature your work on this page, and even potentially bundle it with a future release of DM2C. Just starting a mod or trying to figure out how? I can point you in the right direction and help you find the resources you'll need to make your mod the best it can be! Displayed setup information doesn't update after using "First Time Setup" until program is restarted. This will be fixed in the next update, but the quick fix is to close and reopen the program (You won't have to go through setup again). Added a first time setup guide. Moved all packaging tools into "Advanced Dev Mode". Added Advanced Dev Mode Tutorial. Change Log (this window) visible from About page. Dev mod now allows for launching from arbitrary directory, which can have its save location altered. Feature: Uninstall button for mods. Feature: Optionally enable automatic import of Game Settings and Custom Characters. Use the Mod Manager to launch the vanilla game.